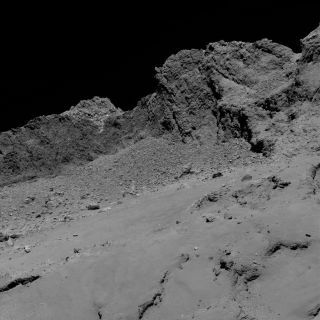 The European Space Agency's Rosetta probe captured this photo of Comet 67P/Churyumov-Gerasimenko during its final descent before the spacecraft crashed onto the comet on Sept. 30, 2016. The dramatic end of Europe's Rosetta comet mission was the most-watched Livestream event of 2016, and another space mission cracked the top five. The European Space Agency's (ESA) coverage of Rosetta's intentional death dive onto the surface of Comet 67P/Churyumov-Gerasimenko on Sept. 30 attracted more than 4.1 million viewers, said representatives of Livestream, a company that provides customers a live-video platform. In case you need more evidence that people love space videos: The five most-watched events in the "Science" category for 2016 all had to do with spaceflight, Livestream representatives said. Rosetta's finale and the Schiaparelli-separation briefing topped this list; Nos. 3, 4 and 5 were ExoMars' March launch, the April announcement of the Breakthrough Starshot project (which aims to blast tiny spacecraft to the Alpha Centauri star system using powerful lasers), and ESA's coverage of the April launch of the Sentinel-1B satellite, respectively. The Rosetta spacecraft launched in 2004 and arrived at Comet 67P in August 2014, becoming the first probe ever to orbit a comet in the process. In November of that year, Rosetta achieved another first, dropping a lander called Philae down onto the comet's surface. Controllers brought the mission to an end on Sept. 30, 2016, primarily because Rosetta and its comet were getting so far away from the sun that it was getting difficult to keep the solar-powered probe running, ESA officials have said. Although the ExoMars Schiaparelli lander separated from its mother ship as planned on Oct. 16, it encountered serious problems during its touchdown attempt a few days later. Schiaparelli's descent-slowing thrusters didn't fire for nearly long enough, apparently because a sensor thought the lander was much closer to the Red Planet's surface than it actually was. Schiaparelli crashed on Oct. 19. But its traveling companion, the ExoMars Trace Gas Orbiter, went into orbit successfully around the Red Planet that same day. Schiaparelli's main task was to help prove out landing technologies that will be used to get ESA's life-hunting ExoMars rover down on the Red Planet in 2021. The information Schiaparelli beamed home during its descent should still be helpful in this regard, ESA officials have said.